Five foot extension hose with quick disconnect fittings stores in the lift base. The foot pump can be removed from its holder and hydraulic hose quickly and easily extended using the extension hose. This provides hands free operation of the pump anywhere around the lift’s perimeter. 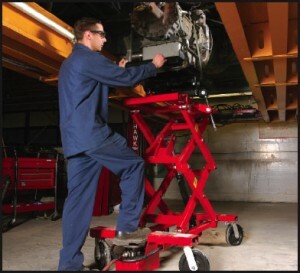 Scissors lift design provides easy 360 degree access to any component. 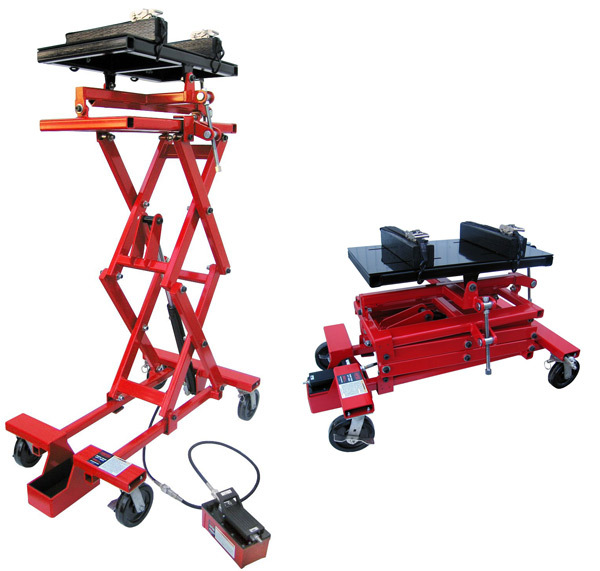 Table top height from 31″ to 80-1/2″. Four 8″ diameter swivel caster wheels for easy maneuverability. Front wheels can be locked in position for steering. Rear wheels can be locked to prevent the lift from rolling.